As I mentioned in my New Year resolutions post the other day I really want 2017 to be the year that I start getting serious about saving. I'm 27 and until last year I didn't have any savings whatsoever, I've always been one to spend my money as I get it or save up for a holiday or a new car but I've never managed to keep any savings. But now that I'm getting older I'm regretting not saving in my younger years. Why did they not teach us this stuff at school?! Financing and budgeting when moving out should totally be a subject! By the time I'm 30 I want to have saved up enough to put down a decent sized deposit especially as it's a lot harder for single earners to get a mortgage these days. Last year I started saving towards a deposit for a house. I don't think I did too badly, however I know I could have easily saved a lot more if I had cut back on my bad spending habits! This year I've given myself a target of £7000 and if I save more then great! Here are some of the ways that I'm hoping to save money in 2017. I've never done this before and I have no idea why, but I have set up a standing order from my current account to a separate savings account on the first day of each month which will go towards my house savings. The way I look at it now is the same as any other direct debit each month so I don't even notice it's been taken out! It's only a small amount but by the end of the year I should have over £1000 put aside. I started this challenge last year but didn't see it through the whole year. I've already started it since Jan 1st and have saved £24.94 so far! The idea is at the end of the day before I go to sleep I check my online banking balance in my current account on my phone. I then transfer any loose change I may have left over under or over £5. For example if I had £101.96 sitting in my account I would transfer £1.96 to my savings account. If I had £90.99 then I would transfer the 99p. This way of saving may not work for everyone but I tend to use my card most days or have a direct debit come out so most days I am able to do this. By doing it this way I don't notice the "loose change" and can quickly build up some emergency savings. 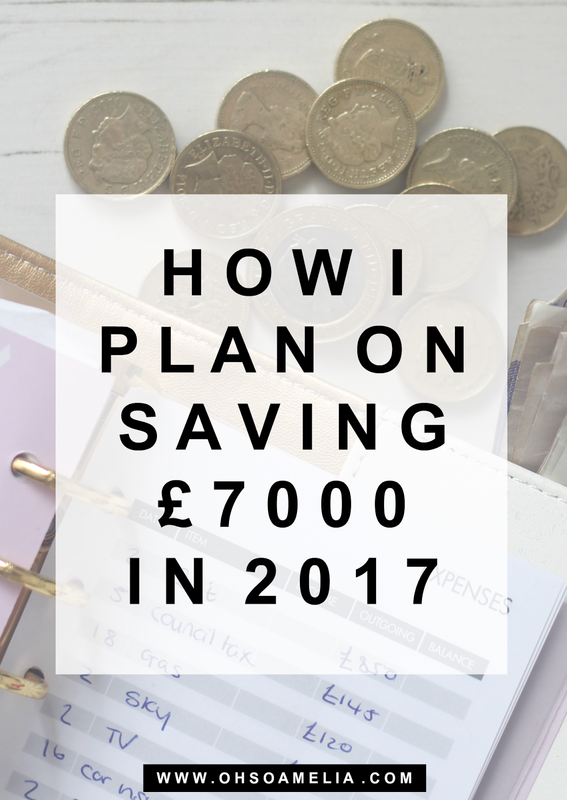 This is another challenge I started last year where I saved a total of £667.95 by the end of the year! The idea is as simple as it sounds, you save every day of the year using this spreadsheet. This money will either go into my emergency savings or into the house deposit savings. I do a LOT of online shopping so this is another great way of saving a bit of cash. I've now been using cash back sites such as Quidco for a few years now and have managed to receive nearly £3000 back! I do withdraw this through out the year but I've always put it towards Christmas presents or buying stuff for the house. This year I want to try and save up as much as I can and put it into savings. This is probably where I could save the most amount of money by simply cutting back on the luxuries! At the end of last year I was spending at least £40 a week on takeaways, £60 every month on my nails, £30 on my eyebrows, and that's not forgetting the amount I spend online shopping or when I pop to the supermarket to get bread or milk and end up spending anything between £20-60! I'm really determined this year to knock it on the head and save money so I know by cutting back on some of these I could be well on my way to having a deposit saved up. Last year I finally cut back on my monthly bills after years of paying ridiculous fees. I got a water meter installed and started saving £40 a month, I managed to get my sky bill down saving over £50 a month and cut back on some other monthly bills too. This year I want to see if I can reduce these even further, whether that be seeing if there are any better deals out there and switching or doing things differently around the house. Such as using less water or saving money on gas and electricity in the winter. My car insurance is due for renewal in March so I'll see if I can get that down any further. When ever I shop online I always check before placing an order whether there is a discount code to use. You can check this by simply typing (Shop name) and 'discount voucher 2017" into google and you may be able to get some discount. You won't always find one but when you do they are extremely handy! Instead of just shoving everything up in the attic to never be seen again, this year I want to start selling more stuff. I usually only ever tend to sell anything if its brand new and boxed on eBay as they tend to be easier to sell. But I have so much junk which most of it is in excellent condition, ranging from baby items, pushchairs, car seats, house decor, clothes which could be sold. I'm thinking of popping along to a car boot sale sometime so that's a good way of raising some cash and then anything else I'll sell on eBay or in local Facebook groups. I have so much up in the attic to sell so I best get started. Eating out can get pretty expensive especially if you do it 2-3+ times a week! I'm aiming to cut this down to just once a week whether that be a Macondalds lunch or an evening meal with a friend. This should definitely save me some money. I really want to cut back on the takeaways and cook at least five meals a week. Meal planning should really help with this and will be able to help me cut back costs on the weekly food shop. I've seen a few friends mention this and thought I'd try it this year. I don't often have a lot of change on me as I pay for most things on my card but I thought it would be useful. I will save every single £2 coin I get and put it in a money tin which I can't open. It may not end up being much but even if it helps with the Christmas food shop at the end of the year every little helps! Now as I have various paydays throughout the month this one is a little tricker for me. But I do have an idea in my head on which day this works best for me so on that day or the night before I will transfer any money I have left in my account to my savings account. As its payday I won't have noticed the money going out. Some months it may only be a few quid but other months it could be a lot more so will build up over the year. What ways are you aiming to save this year? Brilliant list of ways to save money. I'm not aiming to save this year, I'm aiming to clear credit cards and a loan. But also aiming to spend less on takeaways and eating out. Also cut back on random spends whilst at supermarket! Damn that Tesco Extra in Bangor! Good luck with your goal! £7000 is an impressive amount to save! Great list! Given me some great ideas to save this year. My partner saved £2 coins last year for a few months and saved loads! Get a home gel nail kit! I've saved loads not having mine done at a salon! Good luck! Great tips. Will check out the 365 one! All the recommended posts at the bottom look worth a read! Thanks! I think having a standing order to your savings account is so important! It means it's done and you can't accidentally spend it. Even if it's just a few pounds each month, it will add up over the year. Loads of other great tips too, thanks! prepared it, and to my greatest surprise it worked like a miracle! Hello friends! My Name is Mariettal from Australia i have had a lot about Dr Zack Balo on his good work, for bringing back lost relationship but i never believe because so many spell caster scammed me because of my husband who left me over 2years and five months. so a good friend of mine introduce me to Dr Zack Balo just because my condition was so bad and the responsibility in my matrimonial home was more than me. my husband left me to another woman without giving me a good reason why he left. so i email him on his address wiseindividualspell@gmail.com and told him everything, he told me not to worry that my husband will come back to me. he only told me to believe on him that after casting the spell my husband will come back immediately and beg for forgiveness. he real did it for me and my husband come back to me in the next three days. i was very happy and thankful to Dr Zack Balo for helping me restore my marriage here is his email address wiseindividualspell@gmail.com for you to contact him today and get your own help. Hello everyone am jesae by name, i looked forward to be a whole family again with a love spell, I actually got tired of living a depressing life. I was so unlucky that my husband fell out of love with me; he keeps threatening me with divorce paper almost everyday. But all I wanted in our home are positive thinking, love and happiness all the time. I wanted us to be good parent to our kids.When Dr. Bello stepped in with his helping hands via bellospelltemple@gmail.com I began to feel lighter on the inside, I stopped having that heavy feeling on my chest during the process of the love spell. Two days after, my husband started exhibiting some positive character. He confessed that he was thinking of me more recently even when he was with his girlfriend. I was overwhelmed when he came to me and apologized for every wrong he has done to me, I also apologized to him as well. Dr Bello. I just want to say thanks for the patience and kindness shown to me during the whole spell process. My husband and I has been living happily after the love spell, none of his ex ever comeback. you can also call or whatsApp him on +2348147271779.